Yo ho ho and a bottle of rum! Join Jane on the ultimate pirate adventure where you'll have the chance to explore the wild seas and hidden islands. You'll not only be going on an exciting journey aboard the grand pirate ship, but you'll also be going on treasure hunts and will be taking part in contests to show off your pirate skills. This 5 reel, 20 payline slot not only has great 3D animated graphics, but also an amazing set of features. This include scatters, free spins, wilds and a bonus round named 'shoot the tankard'. Don't worry, there are tips below on how to play online slots like this one. Find out more games like Wild Jane. Here's one of the popular online slots, Wid Jane. 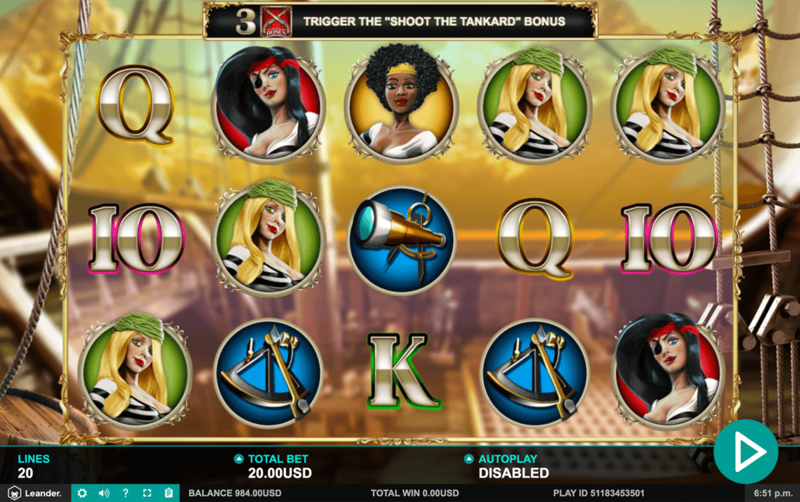 Wild Jane is a pirate themed slot created by Leander which has 5 reels and 20 paylines. In this slot, you will be searching the 7 seas and desert islands to find what every pirate wants, a treasure chest filled with pearl necklaces, gold coins and rubies. The reels are placed inside the big pirate ship. In the distance, you can see the stormy and choppy seas, which makes sailing the ship a little more difficult. The symbols include lots of lovely, feisty lady pirates, a telescope, the jolly roger, pistols and a treasure chest filled with coins. 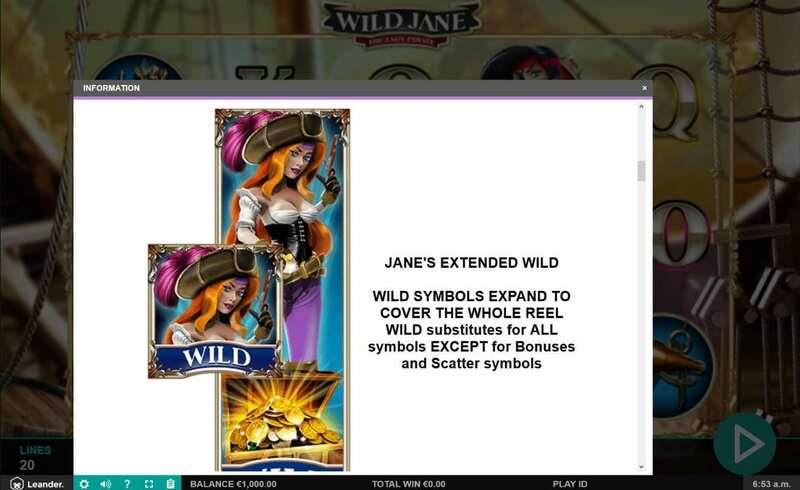 The Wild Symbol - Jane, the pirate with black hair is the expanding wild symbol in this slot. She has the power to create winning combinations but does not replace the scatter. The Scatter Symbol - The jolly roger is the scatter symbol. The scatter helps you create winning paylines. Land 3 or more scatters to reveal a prize. Jolly Roger – is the Scatter symbol for Wild Jane casino slot. It brings the winning independently of the winning lines. Hit 3 or more Jolly Roger anywhere and get your prize. Bar Room Bonus - Landing 3 or more pistol symbols will unlock the bar room bonus. During this bonus round, Jane will shoot down 6 beer tankards to reveal a cash prize. The biggest prize up for grabs here is a 49x multiplier. Treasure Hunt Free Spins - Landing 3 or more treasure chests will take you to the free spins round. You'll have to then select one of the following options: Beth (up to 15 free spins and a 4x multiplier, Eli (up to 20 free spins and a 5x multiplier) or May (up to 25 free spins and a 6x multiplier). Once you have chosen your pirate, you'll be shown a treasure map. Here, you will have to dig to find treasure. Play more here on WS.